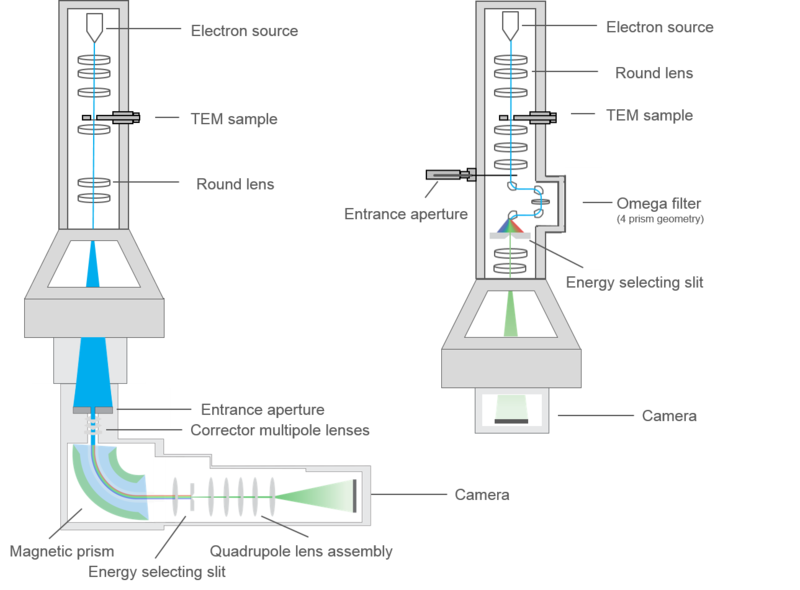 A conventional EELS implementation involves the incorporation of an energy loss spectrometer onto a transmission electron microscope (TEM). The TEM utilizes accelerated electrons to image and magnify regions of an electron transparent sample. Due to their very small de Broglie wavelength (0.0025 nm for 200 keV electrons), these electrons have an extremely high resolving power that enable you to image features at the atomic scale. The ability to steer and focus electrons with magnetic fields allows manufacturers to form strong lenses and relatively compact instruments that can fit in a lab space the size of a typical room. 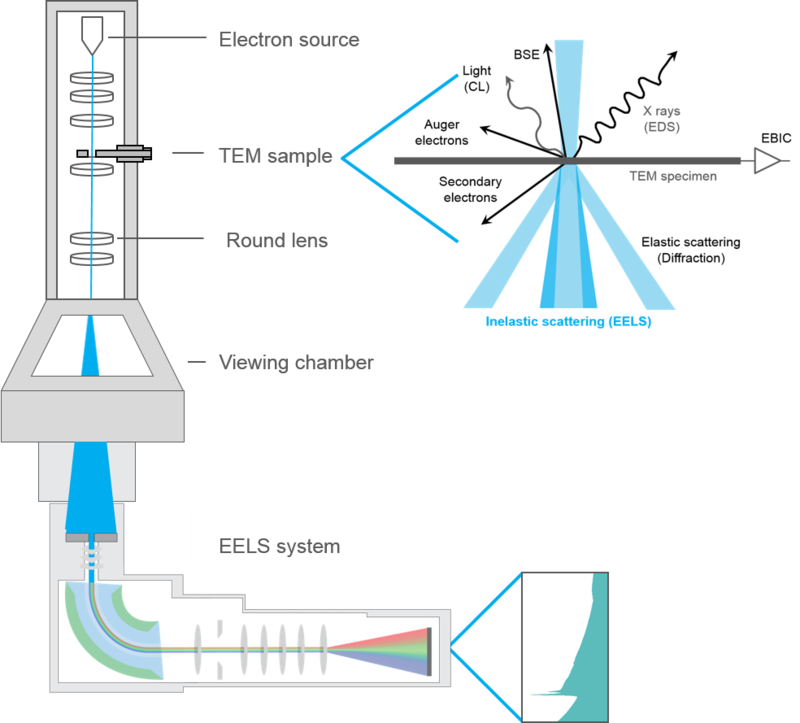 You can integrate an EELS system into the TEM either before or after the final stage image magnification, these are known as in- or post-column types, respectively. Both approaches have their advantages and disadvantages, but the fundamental process is to disperse the electrons in energy with a magnetic field to create a spectrum much in the way a glass prism splits white light into its component colors. To record the energy loss spectrum, you can project the spectrum onto a detector. Alternately, you can introduce an energy selecting slit into the spectrum, then convert the resultant filtered spectrum back into an image to create an energy-filtered TEM (EFTEM) image. These two methods form the basis for the majority of EELS analyses. High energy electrons interact strongly with matter via the Coulomb force. This results in two primary sample requirements that you can use for EELS investigations. The first requirement is that the sample needs to be very thin in order to be electron transparent. For 200 keV electrons, a typical distance the electrons can travel in a sample before undergoing inelastic scattering is on the order of 100 nm. To mitigate this effect, you can extend or contract this distance my using higher or lower voltages, respectively. In addition, you can use a combination of mechanical, chemical or ion beam thinning procedures to thin bulk samples to electron transparency. While the strong interaction of electrons can make thinning samples from bulk materials problematic, the advantage is that in many cases, you can analyze individual atoms of a material. For intrinsically nanoscale materials, such as nanoparticles or 1D and 2D materials (carbon nanotubes and graphene), the strong interaction with electrons makes imaging and analysis of these materials possible. The second sample requirement is that it must be stable in a rarefied (e.g., vacuum) environment. You must evacuate the electron beam path for the TEM to function. The region around the sample is typically under vacuum, however some specialized TEMs or sample holders enable higher pressures in the vicinity of the sample at the cost of reduced resolution. Many materials can tolerate vacuum exposure. Hydrated, wet or volatile materials will evaporate in the vacuum of the TEM. To counteract this destruction, you can dehydrate the sample through a series of chemical replacements of the water and drying without changing the original sample microstructure. Another approach is to freeze the material and hold the sample at cryogenic temperatures to prevent evaporation of the volatile compounds. In the case of hydrated samples, the freezing must be very rapid to prevent water crystallization that will destroy the sample microstructure. This is called single-particle cryo-electron microscopy (cryo-EM).